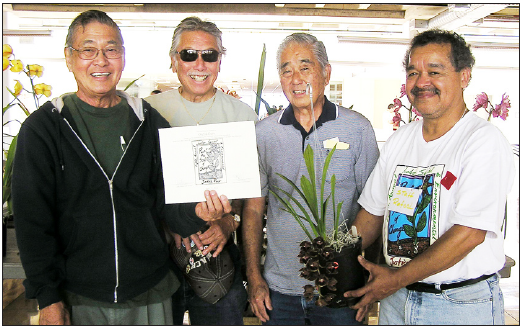 From left: Don Shigaki, Light Matsumoto and Donald Takayama receive a certificate from staff member of the fair, Rafael Tobar, holding a pendulous orchid. CARSON — Japanese American orchid hobbyists Bert Tagami, Don Shigaki and Light Matsumoto from Torrance and Donald Takayama from Cerritos were given a certificate of participation by Dr. Vivian Price, Labor Studies Club advisor, and Kim Nellum, club president, at California State University Dominguez Hills on April 25. The military veteran awardees are ad-hoc volunteers originally from Hawaii. They named themselves the “Orchid Guys” and have been displaying their plants since 2010 on behalf of the CSUDH Japanese garden, Shinwa-en, which was built in 1978 by the efforts by local gardeners, nurserymen, and landscapers. At the Labor, Social and Environmental Justice Fair, the blooming orchids attracted more than 100 students and staff members who received advice from the Orchid Guys on keeping their orchids blooming. The local hobbyists’ group will hold their last monthly meeting of the season on Tuesday, May 21, from 7 p.m. at the Ken Nakaoka Community Center, 1670 W. 162nd St. in Gardena.